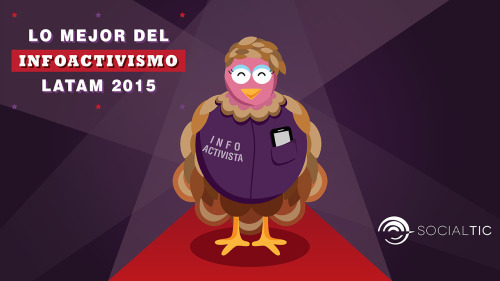 At SocialTIC we finish 2015 with our traditional synopsis of the best of latin american infoactivism (see the2013 and 2014 posts) wishing to share the projects that have inspired us the most and think that every change actor, being an activist, journalist, videomaker, data specialist or governmental hacker, should get to know. This year you will notice two new categories, one on ICT and Gender projects and another one on Data-driven Narratives. And even though we try to be aware of everything that happens in the continent, given our postal code you certainly will notice more detail on Mexican experiences. However, if you identify a project that should form part of this post, please let us know writing to contacto [at] 204.93.177.101/~socialtic or troll us at @socialtic. 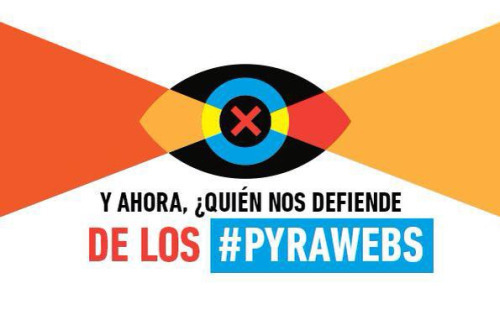 Paraguay rejected the #Pyrawebs law that would oblige internet providers to track and store traffic data of IP addresses for 12 months. The campaign managed to inform, involve and mobilize internet and specialist communities from all over the region gathering the pressure necessary to stop this law. Analyze the campaign site pyrawebs.tedic.org, know the story behind the campaign and identify the keys for success. We want to give a special attention to Miles Chile for their campaign in favor of the Therapeutic Abortion Law that with strong and direct tone brought by their videos, managed to position the topic in the country and in the Congress. In Mexico City, the recent campaign #AsíNo (NotLikeThis) against the arbitrary project of the Corredor Cultural Chapultepec (#CCChapultepec) brings to us examples of informative and of mobilization actions that different groups of neighbours, activists and opinion leaders specialists carried out to get the citizens to vote against the project. And we can not forget all the infoactivist actions in Guatemala that for several weeks made the voices of thousands heard, that evidenced the government’s corruption, that witnessed the surfeit and that kept civic transformation. We hope that the in 2016 Guatemala can become an example of citizen participation as they start. As we know, the real changes only will be achieved by if citizens can permanently demand government accountability, justice and effectiveness. 2015 closes with a campaign that addresses directly the construction of Internet without violence. Alerta MachiTroll seeks to point out behaviours that attack directly women online and uses the humor to call create awareness. Navigate, identify a MachiTroll comment, assess if the troll can be rescued or his machism is incurable, and share it. And once again, it is clear there are people that through their words taken to thousands via web cam are building more mindful citizenship, speaking with openness, information, and charisma about topics that sometimes we can’t even talk about at home. In 2015, our geek guru @OhpCourse Diagno-Cis, opened up a YouTube channel where she talks about gender, transexuality and transfeminism from her own experience. Half of the webcast highlights an open space for anyone to ask questions and share reflections. Our mention goes to the brazilian project Virtual Racism, made by Criola, that printed offensive and violent messages in the public spaces closer to their authors to make visible the violence in networks unmasking the aggressors. And, also as part of the experiments “from the online-to-offline” promoted by SocialTIC Managua Furiosa brought successful virtual campaigns against street harassment to the streets and the performance team of Colectivo Carabina managed to demonstrate that you can do theater interventions in public spaces based on scripts and physical-audiovisual elements entirely from real digital conversations. We live in an online-offline society, so the infoactivism should know what happens in both worlds and expertly address the needs of dialogue and information in all spaces. This year with theAtuServicio.uy project, DATA and the Ministry of Public Health of Uruguay managed to make a valuable synergy to open and display data from health care providers in the country so that every person can make decisions on where to go and how to advocate to improve health services. And despite the progress of commitments and speeches about open government in several countries in Latin America, there are still very few cases where there is a genuine and profound partnership between citizens and government. We make a special mention to the Tres de Tres (# 3of3) project of Transparencia Mexicana and IMCO that during the Mexican intermediate elections demanded that the candidates published their tax, patrimony and interests declarations. The project transcended the electoral period and now is a platform for permanent accountability to those that already hold public positions. Finally, one of the most ambitious civic-tech projects goes live. Mãe d'Água driven by Rede InfoAmazonia in Brazil places inexpensive sensors in thousands of aquifers points in the Amazon to measure and detect quality water in real time. This project inspires everyone to measure, monitor and evaluate what happens around us. In Venezuela elections, we need to make a special mention to the independent media, tireless infoactivists and courageous citizens managed to report, dialogue and share information through the election period despite the shortage, censorship, attacks and the worst internet connection of the region. We highly recommend reading this post from @LuisCarlos on the context and current challenges that alternative media face in Venezuela. And in Mexico, technology was present as the means to maintain the memory of the forced disappearance of the 43 students from Ayotzinapa. It was the creativity, empathy, and discipline of Mexican infoactivists that during a whole year managed to visibilize the tragedy, sensibilize reaching out to people beyond the activist circles, and resist. We want to highlight two video projects. In Chile the series of strong videos for the campaign in favor of Therapeutic Abortion effectively positioned the issue in every viewer. And with a very different tone, the social organization Espolea created a muppet-style character called Lugo Potamio that in small video capsules describes different types of drugs, detailing their components and reactions when consumed so that consumers can be knowledgeable of what they are ingesting, their effects and possible risks. On 2015 the 2nd international Video for Change convening was held in Mexico gathering videoactivists from all continents followed by a Latin American convening. During the event, more than 350 initiatives of different uses of video throughout the region were documented. And as a novelty, Argentina realized the 1st video transmedia as part of the coverage of their elections. We want to mention projects where civil society organizations, collectives and activists are producing audiovisual content both as part of everyday communication campaigns as seeking to be a real alternative to traditional media. In Mexico, as part of the infoactivist actions of the campaign #AsíNo, the Supercívicos utilized comedy to explain the arbitrariness and inconsistencies of the #CCChapultepec project. In the news background, Cencos consolidated its news channel focused on human rights and freedom of expression in Mexico, The Plan Estratégico de Juárez launched its local civic news and Red Tz'ikin in Guatemala produces its biweekly community television program. Argentina gets all the awards! The interactive application (mobile and web) Yo Quiero Saber was launched so voters compared their differences and similarities with those of the candidates. Once again, Andy Tow analyzed data during this loooong election period to display trends in the polls, created the ballot simulator and made the coverage and displayed the election results. And in the media, La Nación Data made a detailed analysis and data visualization in each electoral phase. In elections in Guatemala and Mexico, Plaza Pública and the newly created team MilenioDataLab created important views of the election results in real time. And we should also mention that two successful replicas of civic technology were made, first Cargografías was adopted by Animal Político to display public positions of the candidates to delegates in Mexico City and Red Ciudadana launched CandidatosGT replicating Vota Inteligente from Ciudadano Inteligente (Chile) for the elections in Guatemala. 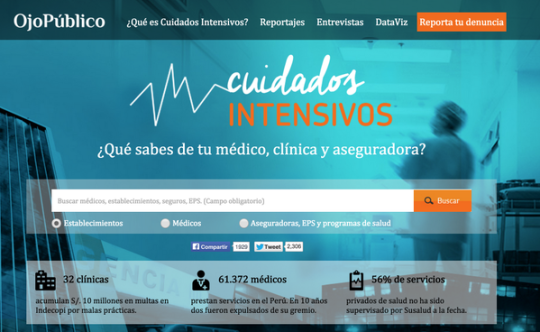 From Peru, the independent investigative journalist team, Ojo-Público, created the platform Cuidados Intensivos where you can view information about clinics, doctors and private insurers in the country to promote informed decisions by users. Ojo-Público uses data as a platform to generate different depth reports and analysis around Peru’s health sector. We give a mention the project Entre Todos of the mexican journalists collective Quién Compró who as the 3rd place winner of Desarrollando América Latina 2014 received support from Engineroom to develop a platform (based and inspired in VozData) that enables users to free the access to the expenses of the Mexican Congress. In Guatemala, Red Ciudadana launched A Dónde Van Mis Impuestos where the budget is displayed and allows citizens to learn about it and get involved. Both platforms are functional and their success will depend on the involvement these organizations and allies promote with their potential users. We hope that all those apps developed in 2015 that are finished but have not reached users, overcome their technical, operational and institutional challenges so that in 2016 they get to impact people’s lives. Note for Mexico: What happened with InFracción y Semáforo Nutricional!!!? It is urgent that we get those apps in our phones. We start this category highlighting a project we absolutely enjoyed being a part of. 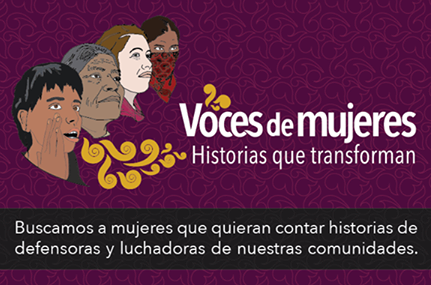 Voces de Mujeres, the result of a collective of collectives of communication, civic-technology and social activism that worked together with women communicators to document stories of their own community leadership and resistance in central Mexico. We give a mention the expansion of activities of Chicas Poderosas in Argentina, México, Colombia, Perú driving more spaces, reflections and empowerment for women in media. Within the Wikimedia community, in Mexico the Editatona concept was incubated, being it women’s meetings to edit Wikipedia with gender perspective. And with a vision of technological empowerment and transformation of the role of women, Laboratoria is training young women in Mexico to code. We also start this new category with aiming to encourage reflections on how to make data stop being just percentages and graphs in order to become the arguments that shape comprehensive and transformative stories. We give two acknowledgments of different nature. First we want to thank Pictoline for demonstrating that information from Syria, Star Wars and Ayotzinapa can be visualized in the same space, maintaining a cheerful, simple, educational and attractive narrative for digital users. Pictoline’s multimedia and gifs transcended audience clusters and are influencing in agile formats of digital communication the media and activists. Secondly, this 2015 saw an important growth of the use of data in journalism in the region. Colombia, Peru, Mexico, Guatemala and Bolivia elaborated diverse articles from data units, research journalists and projects in alliances between journalists, data analyzers, visualizers and programmers. And, in Brazil, Argentina and Costa Rica, we saw the consolidation of media specialized in the field. We finish this yearly account of projects and experiences eliminating the category “Best Event” since in recent years several Latin American spaces have been consolidated, to reflect, acquaint us, involve new infoactivists and continue to generate new collaborations. Regionally, AbreLatam-ConDatos, Media Party, Facción, ELLA and V4C are now known community spaces whose challenge is for their members to build multidisciplinary communities and activities locally, in cities where share experiences and visibilize the emerging projects will drive local projects and collaborations. 2015 was a year where innovation came largely from individuals and informal collectives of civic participation rather than media or civil society organizations. For us, it is very clear that the boundaries between media, data analysis and visualization of information, civic technology and activism are being increasingly erased. The need for permanent and multidisciplinary collaborations is reaffirmed to generate high-impact projects. And, every infoactivist effort should understand and influence its strategic audiences both online and offline and that creativity and art can be a crucial component to position and engage citizens groups foreign to the issue. Latin America remains tainted by injustice, oppression, corruption, inequality and the closure of civic spaces. Experienced infoactivists should keep learning, experimenting and evaluating our actions to generate larger scale impacts. And for those who are starting, we hope they learn from previous experiences, experiment, disrupt and provoque better ways to visualize problems, analyze social contexts, interact with their key audiences and communicate sending strong information-driven messages while taking advantage of the combinations that graphic, interactive and physical communication media provide.